You just got home from the hospital (or perhaps you had a home birth) with your tiny newborn. You know these moments won’t last long and in a matter of weeks your precious bundle will no longer be a newborn. You are looking forward to your newborn photography session in a couple of days; you are so glad your photographer is willing to do the session in the comfort of your own home, it takes so much of the stress out of taking pictures. EXACTLY! And when you are relaxed, so is baby. And Dad too for that matter! He will be far more relaxed knowing food is just a room away! 😉 Some families want to take their baby out right away and going out to a studio is no problem, in fact they may even welcome the much needed outing. For others, going out a few days after birth is just not an option. Some families need some time at home with baby to recover, relax and get used to this new way of life. That is when having your newborn photography session at home really comes in handy! From looking at the pictures, you’d never be able to tell they weren’t taken at a studio……. But being at home does give us the opportunity to capture those intimate lifestyle shots. Everything needed for the session is provided for you by me. I create a warm, relaxing and peaceful environment in the comfort of your own home. And… anything you need is right there at your fingertips; whether baby needs to be nursed or changed, mom or dad need a snack, this newborn session is relaxing, fun and stress free. On April 1st we welcomed our most sweet, sensitive, precious gift to this world. My husband and I couldn’t have been happier to meet our first baby, Eleanor. I had a very quick, but very intense labor and delivery. I expected to experience pain with the labor and delivery, but did not know how much pain I would continue to be in for the next 2-3 weeks. I could barely sit without pain, let alone walk or do much more than care for Eleanor. I cannot imagine being able to load up our 5 day old newborn and take her anywhere. 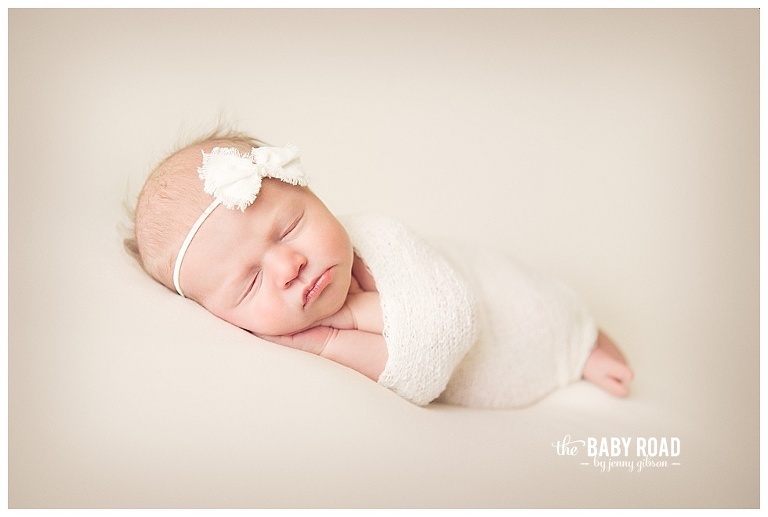 We were extremely blessed to have Jenny come to our house for Eleanor’s newborn photo session. I really had no idea what to expect, and honestly, I did not have time to think about it. All I knew was that she told me she would take care of everything, and that I didn’t need to worry about anything. She said she’d bring the props, outfits… everything, and that all I needed to do was relax. What a blessing! I knew that I wanted newborn pictures, but I did not know if we would be able to do them. As I said before, I can’t imagine being “with it” enough to actually take our tiny little babe to a studio. I also didn’t want to take her out of the house yet, maybe it’s because I am a first time mom, but I just didn’t want Eleanor to have to leave our house if she didn’t have to. All I did was send Jenny a message on the day Eleanor was born, we scheduled the photo session for a few days later, and Jenny showed up to our house when Eleanor was a tiny 5 day old bundle. Jenny unloaded all her equipment while I snuggled Eleanor on our couch. She brought a heater so that during the session Eleanor would stay cozy and warm. As I watched Jenny work with Eleanor I was so grateful that we were able to be in our own home for all of this. All three of us, my husband, Eleanor and I, were able to relax because we were in the comfort of our own home. I have to say, at first I just sat there and watched Jenny work with Eleanor, I loved watching her with our daughter. She was so gentle and careful, I could tell she loves her job, and she is so good at it too! She was so wonderful with Eleanor that I started taking mental notes on how she handled her and soothed her (remember, first time mom here!). You would never know that the pictures were taken in the privacy of our own home, where I could feed Eleanor as needed, snuggle her as needed, and lay and relax on our own couch as needed. l could go on and on about how perfect it was to have Jenny come to our house rather than having to take our 5 day old sweetie to a studio! I can’t imagine having newborn pictures done any other way. © 2019 The Baby Road by Jenny Gibson-Roseburg Oregon Newborn Maternity and Child Photographer|ProPhoto 6|Design by Northfolk & Co.